Once again, the sound of around 700 horsepower pulsed the Toronto waterfront in a sound wave I can only term angelic. The keepers of Honda engine power, the drivers of Dallara race chassis vehicles was given a second chance to burn up the steaming hot streets of Toronto. Taking several vantage points across the track, I was able to hear the tones of the open wheel IZOD INDYCAR machines blitzing the race track. In the afternoon session, the notes of the morning session have provoked a harder charging mentality amongst the drivers. Only 8 minutes into the start of the IZOD INDYCAR Series' second practice, the #77 Sam Schmidt Motorsports car piloted by Canadian hero Alex Tagliani spun in turn 8. Briefly stoppd on the course, Tagliani's car was impacted by Graham Rahal's #38 Chip Ganassi Racing Dallara-Honda. Creating the first full course yellow in the session, the practice restarted promptly after the Holatro Safety Team were able to assist both vehicles in restarting. Afternoon practice for the IZOD INDYCAR Series was slowed once more when 2004 Toronto race winner Sebastien Bourdais stopped in the same turn 8 area as the Tagliani/Rahal caution prior. The second practice ended with the #12 Penske Racing car piloted by Will Power claiming the edge on the 1.755-mile race course. Maintaining a cautious optimism, Power commented, “The Verizon car is good, but we are still not quick enough.” The reigning winner of the Honda Indy Toronto, the Australian mentioned, “It is great to be in Toronto, through, and really good to see all the fans.” A final chance to get an impression for the Toronto street course during the first day of the event's three day run, drivers were both eager to rest after a testing day on the bumpy city streets and debrief with crews as they search for more speed. The fourth fastest in the session, Canadian James Hinchcliffe provided a lap giving the hometown crowd a real reason to cheer. As with every Honda Indy Toronto I've attended the appearance of Paul Tracy is equally as appreciated regardless to his practice time performance. Besides, any Paul Tracy fan knows the “Thrill from West Hill” truly shines during the actual race. Following the IZOD INDYCAR practice, the excitement level at the track was maintained by the performance of the NASCAR Canadian Tire Series conducting their time trials for Saturday's main event. Divided into groups, the stock cars were released up to the track in order to post fast time. The most anticipated performances during the NASCAR Canadian Tire Series qualifying were expected from Andrew Ranger and Jason Bowles making part-time appearance in the tour. Both skilled road racers, it was Andrew Ranger who posted a pole-winning effort with Bowles settling for a front row starting position beside his main opponent. Crucially fighting for the championship in Canada's top stock car racing series, Scott Steckly was third quickest in the #22 Dodge. One of my last duties at the race track was to observe the post-qualifying press conference held in the conference room. Unlike the previous years when I had so much fun at the track but knew when it was time to leave, this year's Honda Indy Toronto was not so clear. Even past 5 PM, the track environment still felt lively as spectators were still rounding the track and walking through the paddock areas of race teams. On the track, the Castrol Canadian Touring Cars were rolling with the sound and look of street cars. 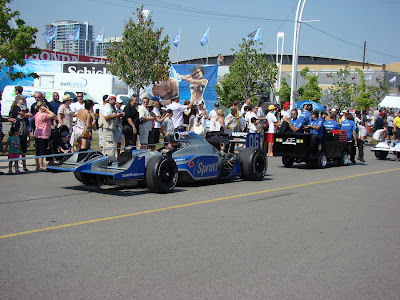 Witnessing the first day of the 2011 Honda Indy Toronto, the health of the major motor racing festival could be given a clean bill. 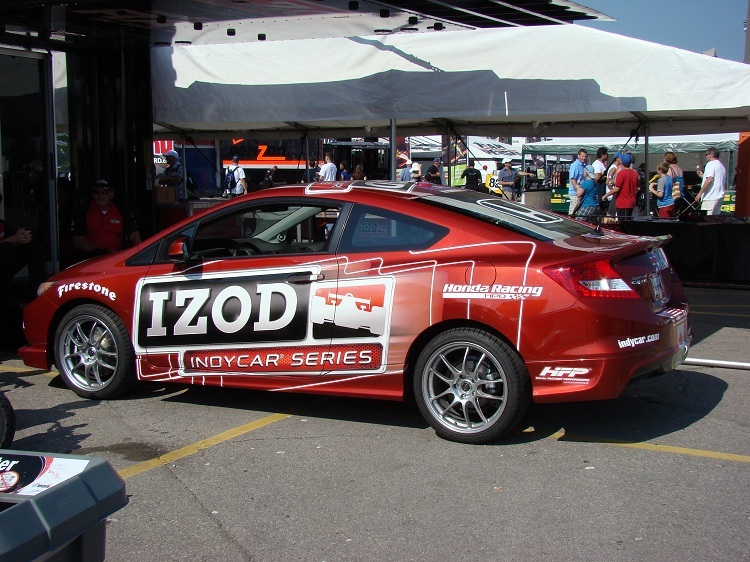 Thanks to some brilliant weather, successful promotion through events such as Honda's Free Friday, and the gaining stability of the headlining IZOD INDYCAR Series, this 2011 Honda Indy first day lured one of the biggest crowds since the early 2000s. As I left the race track, I was gladly greeted by a Dr Pepper brand representative providing a complimentary can of pop as a final act of courtesy to race fans. Leaving the track where I partook in the start of what could be one of the greatest Honda Indy events since INDYCAR reunification, the inefficiency of the City of Toronto was presented with the TTC Streetcar service. Normally, I am very grateful and would speak highly for the TTC service. However, for some bizarre reason, the TTC streetcar would not receive passengers near the Princess Gate requiring prospective riders to walk more than half a kilometer down the road to the next streetcar stop. While it is all right for someone able bodied such as myself, my concern was over families with little children walking across the roadway used by under-considerate Toronto drivers. It was also disappointing that the TTC dispatched a smaller streetcar to pick up the large crowd leaving the 2011 Honda Indy. Despite this late day inconvenience, my excursion to the Honda Indy Toronto can not be substantially impacted by a return to real life. In fact, the Honda Indy is one of the few times in the entire year I personally feel completely alive. Unable to completely bring myself to realizing my emotions, it has taken me about a month to completely finish my thoughts and experiences of this one day. To celebrate the automobile in the best fashion through good natured competition, cars being unleashed to their full potential, even the knowledge I am only one of many in this Toronto makes me feel so enriched by what is probably the only love I need in my life. The photo presented below is a complication of afternoon practice action for the IZOD INDYCAR Series.